The Port of Felixstowe, in Felixstowe, Suffolk is the United Kingdom’s busiest container port, dealing with 42% of Britain’s containerised trade. In 2011, it was ranked as the 35th busiest container port in the world and Europe’s sixth busiest. 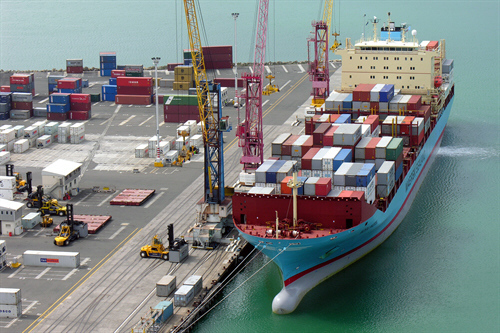 The port handled 3.74 million twenty-foot equivalent units (TEU) of traffic in 2011. The port is operated by the Felixstowe Dock and Railway Company which was set up under an Act of Parliament, the Felixstowe Railway and Pier Act 1875 and so, is one of the few limited companies in the UK that do not have the word “Limited” in their name. Much of the land on which it sits is owned by Trinity College, Cambridge which in the 1930s bought some land near Felixstowe which included a dock which was too small to be included in the National Dock Labour Scheme. In 1967, it set up Britain’s first container terminal for £3.5m in a deal with Sea-Land Service. Because container shipping is much more economically efficient in bulk, this early start led to it becoming the UK’s largest container port, despite its previous insignificance to the shipping market.